Let's just be real with each other for a minute... who didn't love this movie as a kid? Better yet, who didn't love Falcor as a kid?! Because I did. Falcor was my favorite flying dog! Er... dragon. Luck dragon? Anyway, I loved Falcor and I thought Atreyu was just the cutest ever. But seriously, I never realized this was based on a book. So when I realized there was a book earlier this year, I knew I had to have it! I even splurged on the hardcover when I read that the text was color coded based on where the action was taking place. How cool is that?! So then I started reading The Neverending Story. It.Was.MAGIC. Reading one of my favorite childhood movies was absolutely magical... in the beginning. I loved every second of meeting all of the same characters all over again and remembering things I'd forgotten. I also loved finding out all the new tidbits that didn't make it into the film. ...because this book is also the story of Atreyu and Fantastica (no, not Fantasia), the amazing world he lives in inside the book. He's the hero, the good guy. It's Atreyu's mission to save Fantastica from the Nothing - a quest he's given by the Childlike Empress, Fantastica's ruler. Atreyu's story is the one that I absolutely adored. As he travels through the world of Fantastica in search of the solution to the Nothing, he travels to amazing lands and meets a completely unique cast of characters. But as the story unfolds, Bastian starts to realize that he's the only one who is able to save all of them. And the Childlike Empress spends pages begging him to DO SOMETHING! After taking ENTIRELY too long to finally work up the courage to speak the single word that will save Fantastica, the entire story shifts into unfamiliar territory. 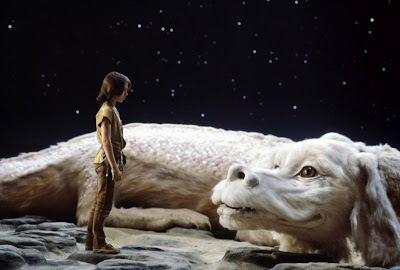 The Neverending Story movie ends halfway through the book and that was not something I expected. What I found was that the second half was totally unnecessary. Part two follows Bastian as he rebuilds Fantastica with his... brain. Or something. Throughout his journeys he also meets many cool characters. Unfortunately, he's a totally unlikeable jerk. I literally had to force myself to finish the book. This is honestly the first time I have ever completely hated a character. Bastian had literally no redeeming qualities and I found myself not caring at all whether he lived or fell off the earth or if his brains turned to mush. If The Neverending Story had ended halfway through the book I would have given this five stars, no questions asked. 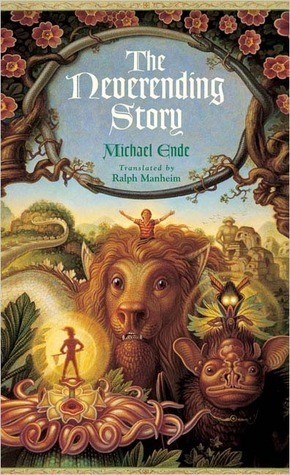 Michael Ende did add on an entire second act though, which left me no choice but to bring that down. I would totally recommend the first half of The Neverending Story to absolutely everyone because, like I said, it's pure magic. Just, please, stop before you get to Bastian's "journey."